In the era before TV, internet, and cell phones, we read about news in the paper the next day, and heard about it on the radio, as it was happening. We had to wait a whole week, however, before we could view pictures taken by daring newsreel cameramen in the theatres as one of the “units” that made up a programme. Never was the desire for real moving images of actual events greater than during the second world war. At 909 K St., the Sequoia Hotel building (still standing and used for offices) housed The Sequoia Theatre on the first floor beginning in 1910. That business lasted until 1931. It became the Sierra Theatre from 1931-1941. With the start of WWII, the demand for the latest images from the war gave birth to the concept of newsreel theatres all over the country. These ran a policy of 24 hour operation of short news subjects, 7-20 min each in length that repeated all day and night. 30 cents got you in and you stayed as long as you liked, or ducked in long enough for the big stories that were re-screened about every 75 minutes. 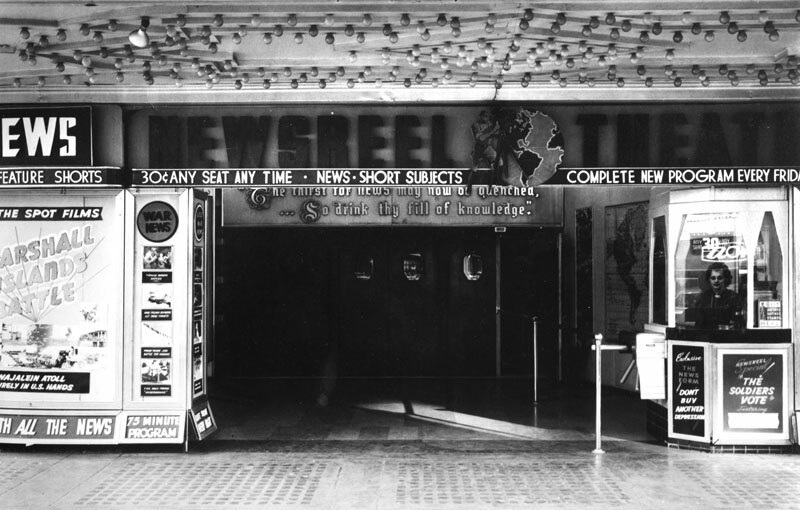 The 542 seat Newsreel Theatre of Sacramento, seen here, lasted as long as WWII, closing at the end of the war in 1946. War was over, and the theatre became The State Theatre (no connection to the other earlier theatre with the same name) through 1955 and closed. The theatre was torn out of the first floor, and the space converted to retail use. Today the space houses Alejandro’s Taqueria.